If you're reading this page, the chances are you have suffered an injury in an all-terrain vehicle (ATV) accident and are in need of a Boston all-terrain vehicle accident lawyer. What exactly is an ATV? It's a heavy motorized vehicle that is used for work and recreation -- such as a three-wheeler or dirt bike. When most people think "ATV," they think "fun." You can have tons of fun on them, alright - until they go at high speeds faster than 40 mph, which can result in an ATV rollover or even an ATV crash. And when that happens, the driver and/or the passenger may suffer a serious personal injury or even death. That's far easier to imagine in these vehicles, than you might think. And when incidents like these occur, you will definitely need a Boston injury lawyer such as The Law Offices of William D. Kickham. Call us right now at (617) 285-3600 or at (781) 320-0062 and we will provide you with a complimentary 20-minute FREE CONSULTATION. We also make house and hospital visits to our clients, and have offices in Boston and Westwood, Massachusetts. Remember, our phone consultation with you is FREE and you will pay us absolutely NO FEES unless, as your attorneys, unless we win your case on your behalf. You have nothing to lose - and everything to gain - by calling our Massachusetts ATV Accident Law Firm. In Massachusetts, there were 71 reported ATV deaths in the period of time from 1982 to 2011. Every single operator and passenger is required to wear a helmet. All ATVs must be registered, except if operated on the owner's land. Owners get a special plate they must place on the ATV. No children under 14 years old may operate an ATV -- unless the child is over 10 years old and in a special event; or 10 to 12 years old and supervised by an adult while on a parent's land; or 12 to 14 years old if supervised by an adult who is over 18 years old. It is against the law to drive ATVs on paved roads or public ways. All ATVs must use a lighted headlight and taillight between sunset and sunrise. Whatever you do, if you have been injured due to an ATV accident, speak to a law firm that specializes in ATV injuries. These types of injuries fall under an area of law known as "defective product claims," or "product liability claims," and these types of cases require specialized legal counsel who have extensive experience in this area of law. Based on the facts surrounding the accident and the type of injury(ies) you have suffered, you may be entitled to substantial financial compensation for your damages. We can discuss all of this with you during your FREE INITIAL CONSULTATION with our office. For more important information about what to do after suffering a personal injury in Massachusetts, click here to receive our FREE article, "The Top 10 Things To Do After Suffering An Accident Or Injury In Massachusetts." This document contains important information, and will show you how to protect your legal rights, following an accident or injury caused by another person's negligence in Massachusetts - and this includes ATV accidents. 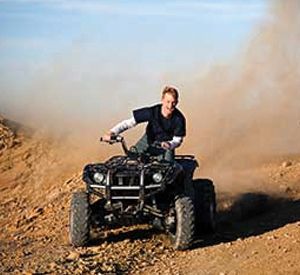 Many people don't know how to proceed following an ATV accident that is caused by someone else's negligence. But in this FREE article you'll discover how to best protect yourself or your loved one and how to proceed following suffering a personal injury. Our attorneys at the Law Offices of William D. Kickham have worked with many injury victims, and are skilled in successful legal strategies needed to litigate these cases and recover maximum financial damages. Get medical treatment. ATV accidents can be quite serious. They can result in fractures, broken bones, spinal cord injuries, nerve damage and even traumatic brain injury. They can also result in death. Second, use your cellphone to photograph the surroundings of the ATV incident - AND any injuries you may have suffered. Photographic evidence can frequently make a huge difference in the successful outcome to a legal case. Contact a Boston defective products law firm that is experienced in ATV accident cases, such as The Law Offices of William D. Kickham at (617) 285-3600 or (781) 320-0062. We have a proven record of success in Boston personal injury lawsuits. Boston, Massachusetts personal injury lawyer William D. Kickham is a legal commentator for several local and national media. He has served as a legal analyst and provided expert commentary on Court TV (now In Session on HLN,) Fox News TV-25/Boston, The Boston Herald, WBZ-AM Radio 1030, WCVB-TV5/Boston, Nightside With Dan Rea, Greater Boston With Emily Rooney, Money Matters Radio/Boston, and The Metro Newspaper/ Boston. Put that experienced background to work for you, if you've been injured in a Massachusetts ATV accident.